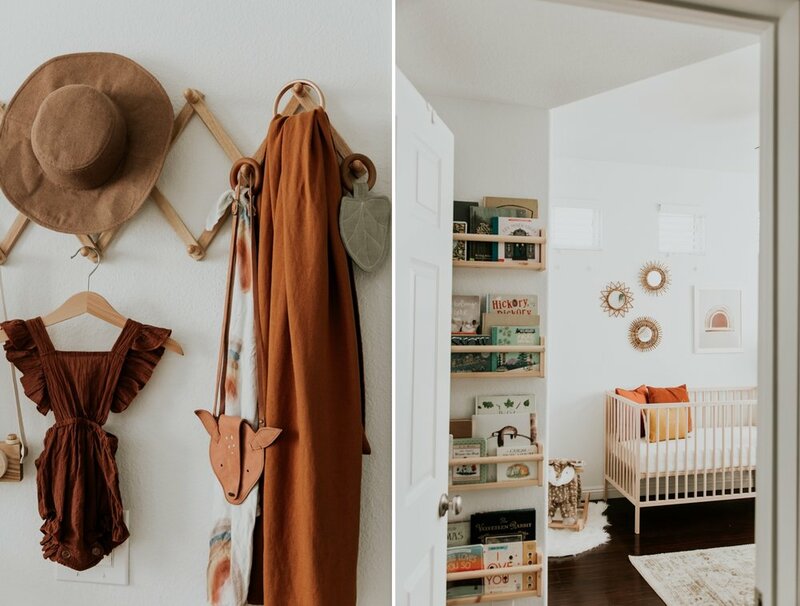 Dreaming up a nursery for our little one began before we ever got pregnant the first time around. 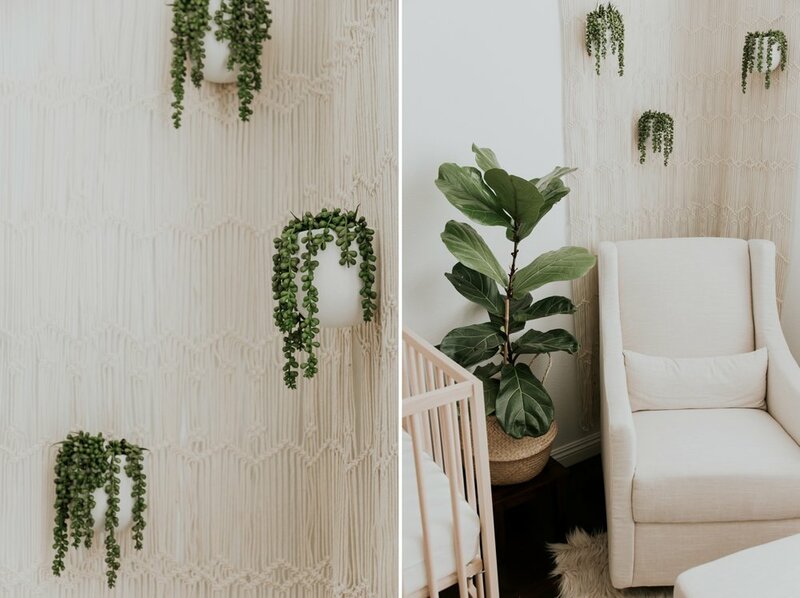 I had a neutral toned semi boho idea with modern touches that would be perfect for any baby boy or girl. I had even started saving items and tucking them away with the intention of using it for nursery decor one day. When we found out we were pregnant with Peyton I of course immediately got excited that putting together a nursery for our baby was going to become a reality and when we miscarried at 8.5 weeks it also quickly became something I couldn’t even bare to think about or be reminded of. For a while it was hard for me to even walk past or go in that room that was meant for our sweet child. 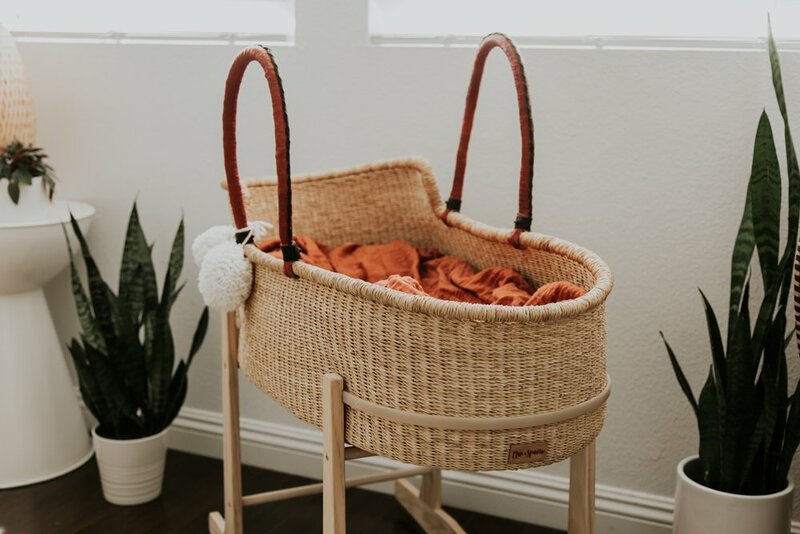 As weeks went on, and healing set in, we clung to the hopes that one day a little life would soon occupy that room and that we would make a home for a baby in there. God delivered, so graciously and has blessed us with the sweetest baby girl who has exceeded any and all expectations! Excitement is an understatement that we got to prepare a place for her. A place to rest her head. A place to dance around. A place to use her imagination. A place to become who God intends her to be. A place to be a daughter. A place to cry and laugh and smile. A place to run and jump.  A place to be loved and know love. A place to read books. A place to pray and know about Jesus. A place to be comforted. A place to be fed, clothed and cared for. A place that will hold memories that we will cherish for years to come. A place that is hers. I wanted a space that wasn’t just on trend or designed for anyone but her, with intention, special touches that hold meaning and reminders that she is our biggest gift and blessing. That she is our rainbow babe, our ray of hope and sunshine whose life was sustained and grown and continues to grow. Getting to use those saved pieces that I thought we were going to use for Peyton made it even more special. 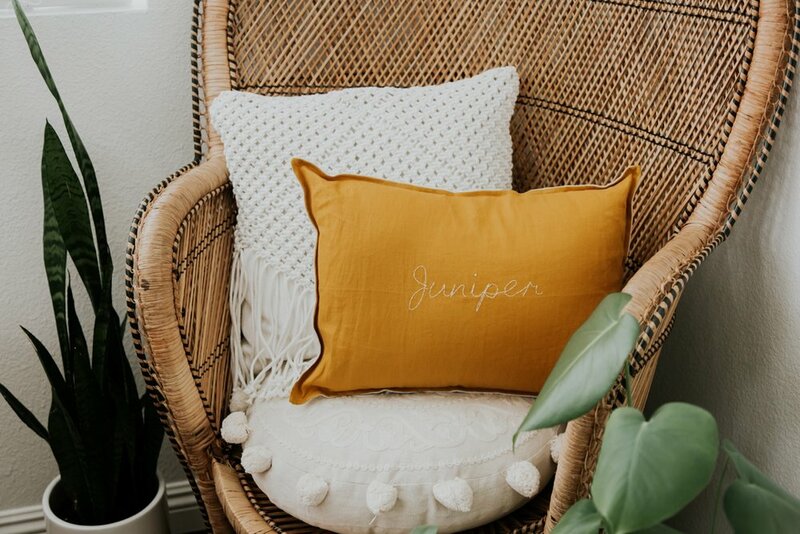 So, I’m so excited to share with you the finished and completed nursery for our little love, Juniper and go through her room and share some thoughts and sentiments that have to do with certain pieces! 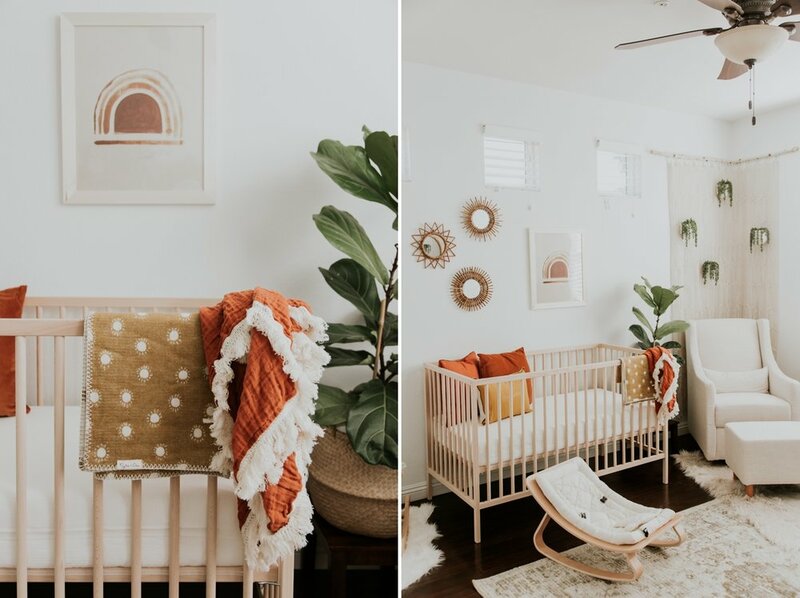 The nursery is one of the brightest and lightest rooms in our place, which I think is quite fitting. 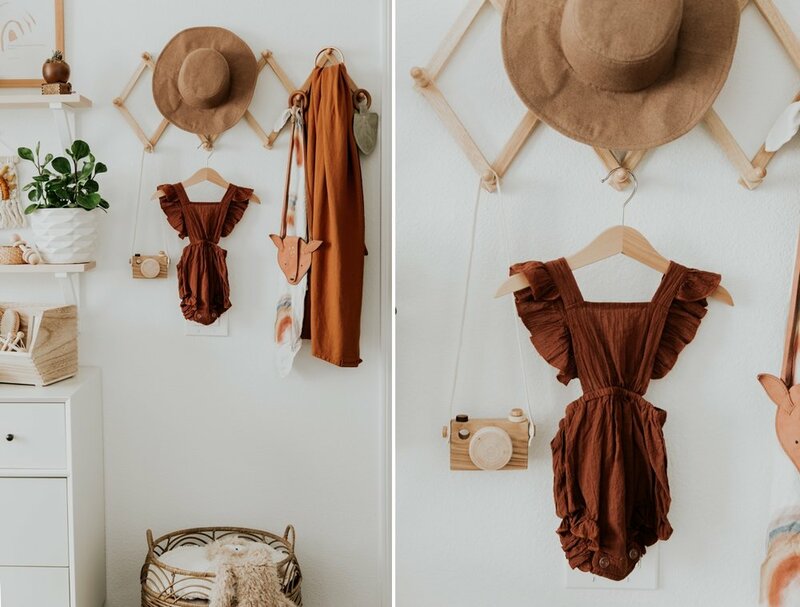 I knew I wanted to keep the neutrals on the lighter side with light wood, a mix of whites & off whites, tans and little accents of mustard and rust colors. 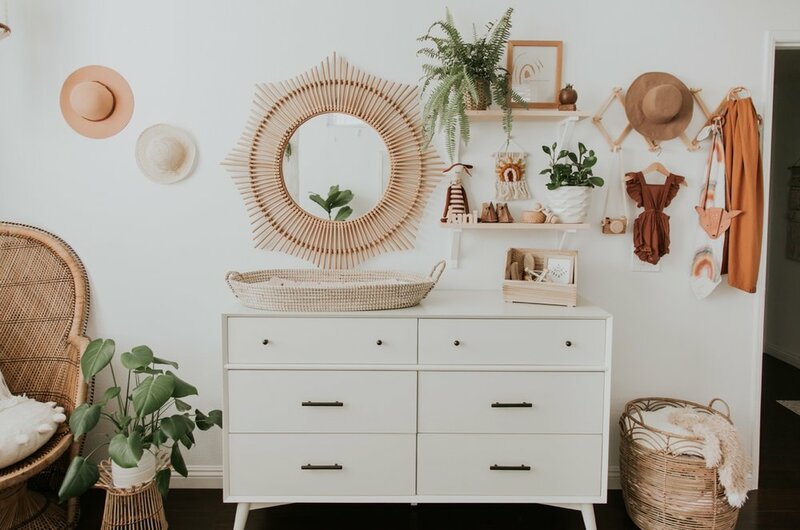 It is also the main room that I have kept all my plants since they have thrived in that room which is also SO fitting, so i wanted to be able to keep a lot of greenery in there to be reminded of life and growth. One of my favorite corners in where the glider is at. 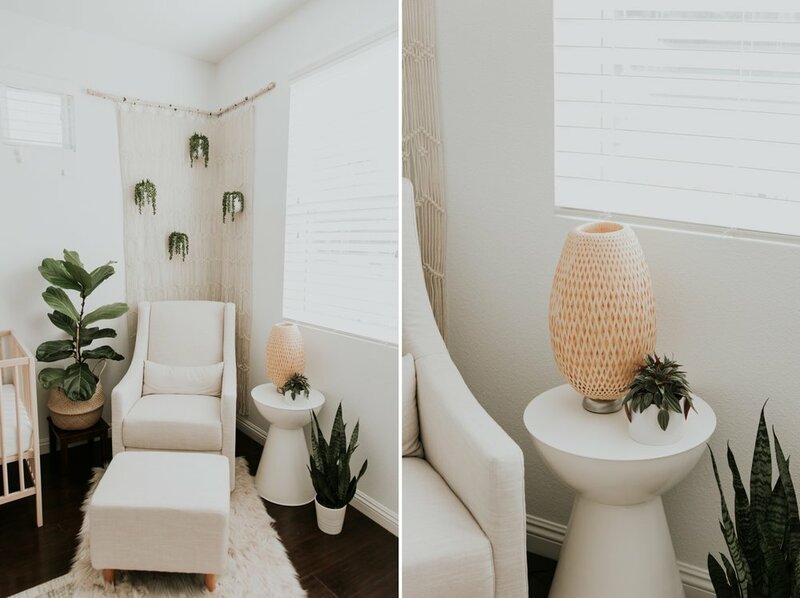 A spot where soothing and comfort go hand in hand with nursing my sweet girl. 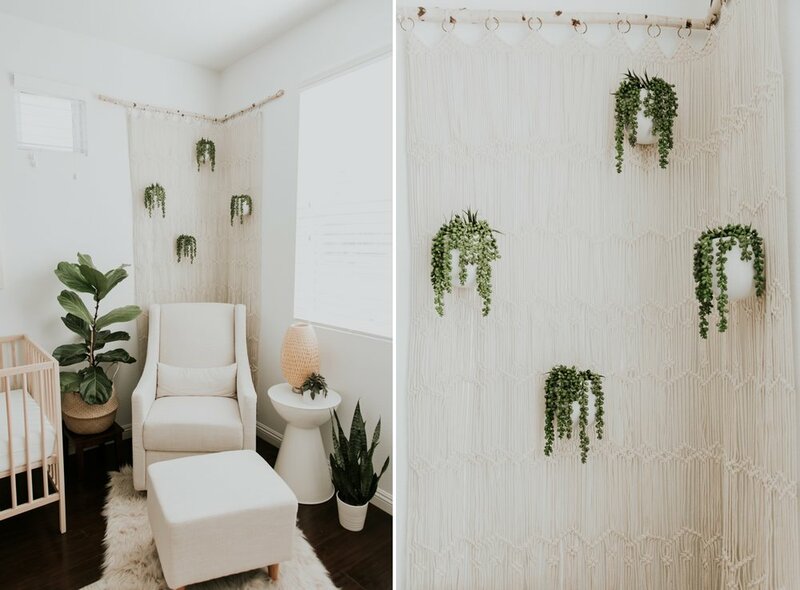 The macrame piece that hangs behind it was actually a curtain that I got two years ago and held onto in hopes of using it for a nursery one day. 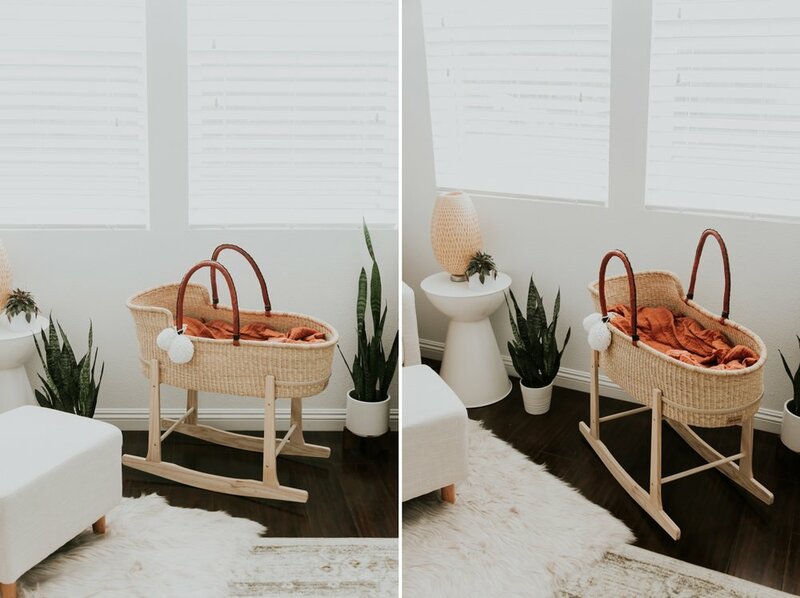 Hooking it on a branch and putting it in the corner and adding the wall planters really ties together my favorite little spot to rest with her. I also love the lamp on the side table because at night it makes for such a peaceful almost night light where I can rock her to sleep. 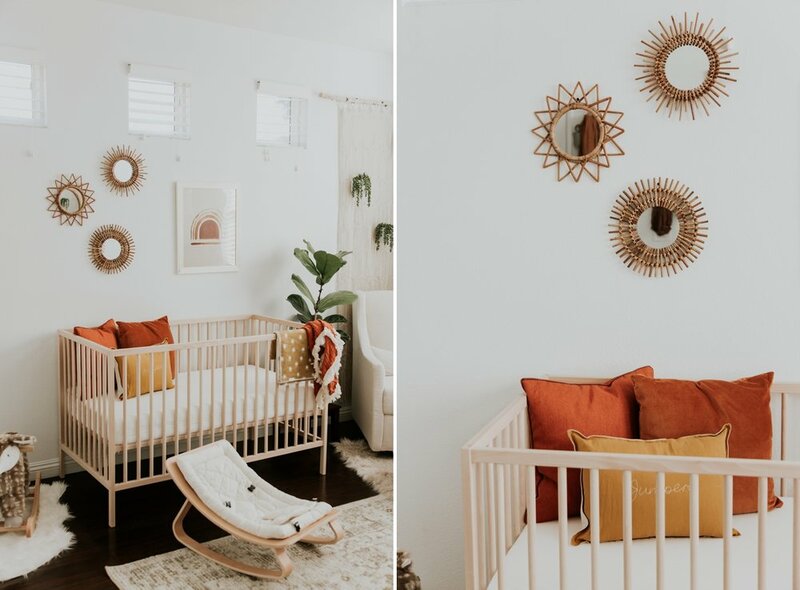 I have had my eye on the famous wood Ikea crib for a long time, but seeing it in her room actually made me cry when we set it up. 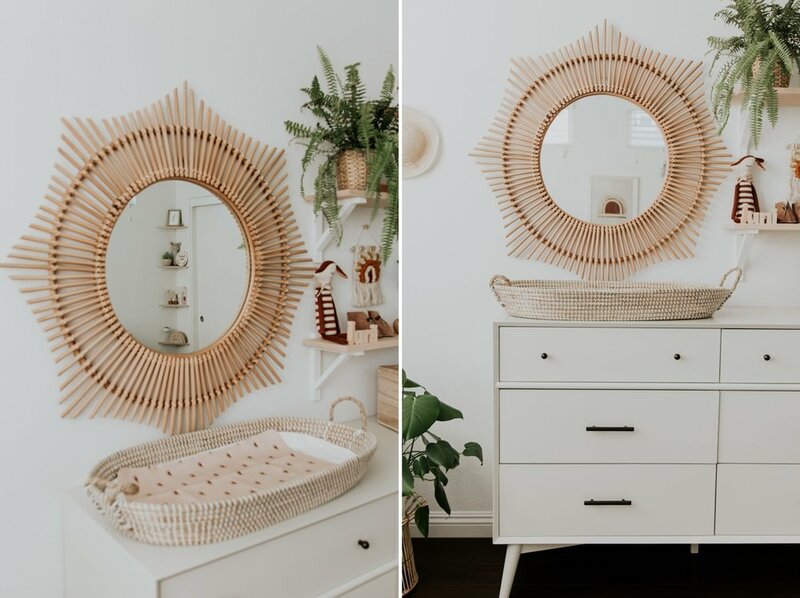 It is now all ready for her and is surrounded by round sunshine mirrors and the most darling rainbow print for our ray of sunshine and rainbow baby. The mirrors were another thing I hung onto to use one day and seeing them in her room now brings me so much joy! Her crib has a couple of my favorite blankets draped over it and is all nestled with colored pillows with one in particular personalized one with her name on it which is so sweet. It also has a VERY special doll that a sweet friend gifted Juniper with. She specially and carefully hand picked this doll for specific reasons. 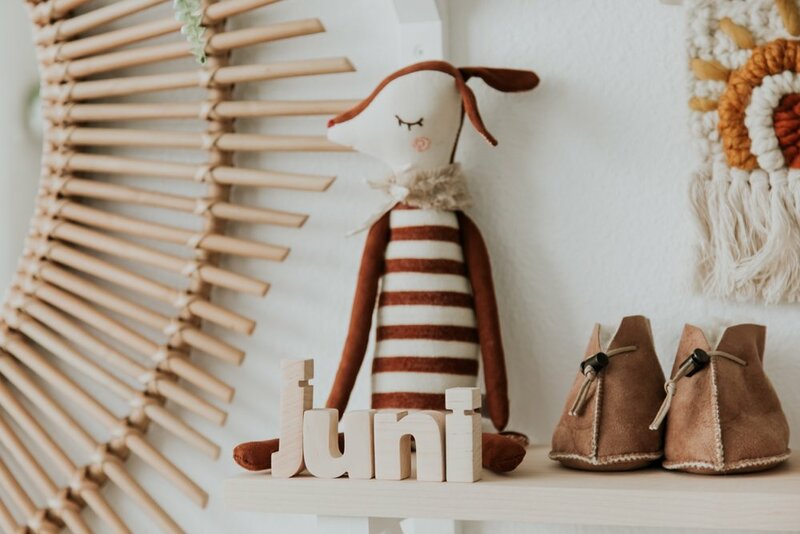 This doll is handcrafted and made in Hungary to remind us and Juni of my grandmother and her great grandmother who passed shortly before we found out we were pregnant again. This doll also has a heart with Peyton’s name stitched on it to remind Juni that there was a sibling that came before her that we all love and will never forget and have in our hearts. 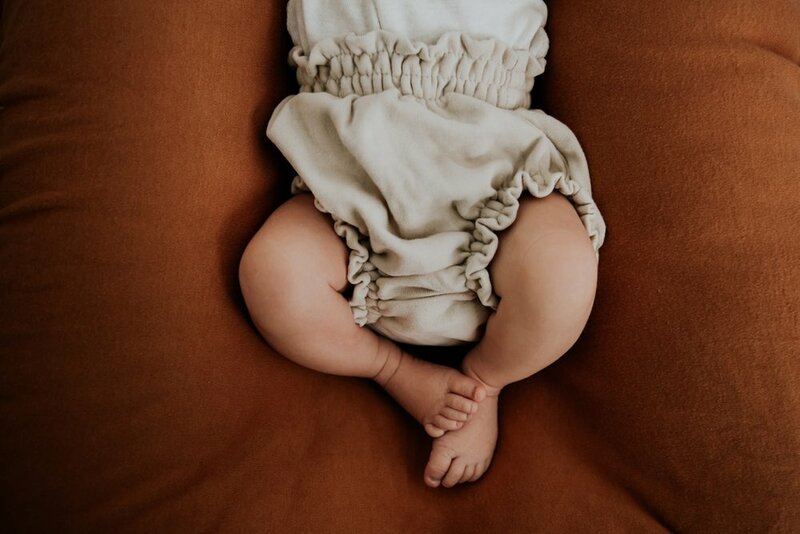 It is one of the most thoughtful gifts and it is a cherished item that I know Juniper will cherish also. I always dreamt of having a moses basket for our baby and getting to have one for her right under her window is a dream come true. I have loved rocking her in it when it’s on the stand or watching her sleep and dream in it when she naps. I will sit in the wicker peacock chair and just stare at her in awe! Her littlest hats have been so fun to hang on the wall, even though they may not fit her yet, I can’t wait until they do! Filling her dresser and closet with tiny clothes has been one of my favorite things to do, I mean who doesn’t love shopping for their baby? 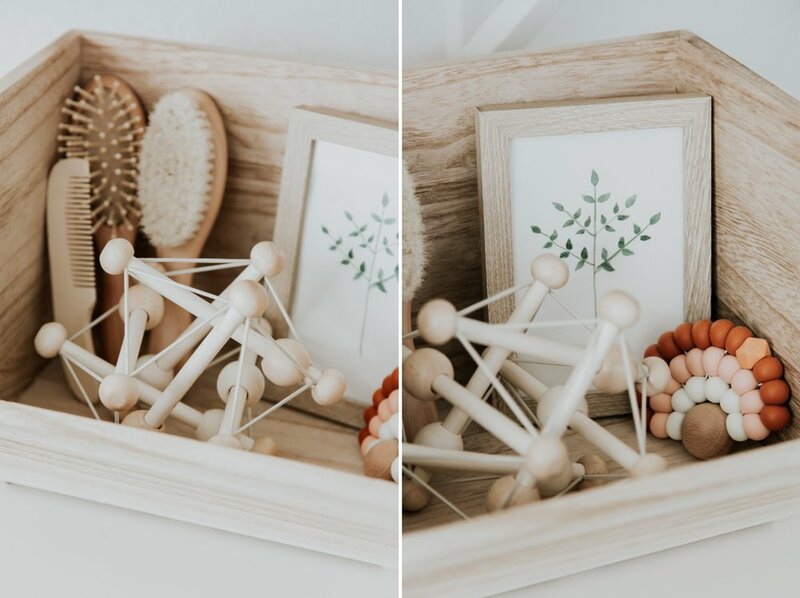 I really wanted to implement practicality with out compromising style, and the changing basket & changing mat felt like the perfect touch for on top of the dresser. I filled the top drawer with diapers and diaper changing essentials to make it even easier on myself when I am changing her there. I really wanted a large mirror that also kinda gave that “sunshine” vibe and I can’t believe I found the one I did, I basically designed the rest of the wall around that mirror because I loved it so much! 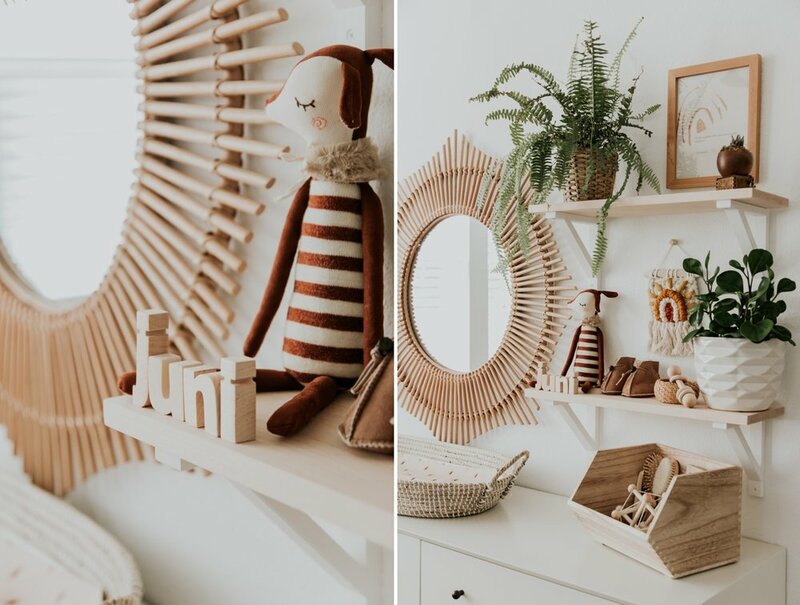 Her shelves are filled with little goodies that have been collected for her over time from her little deer doll, to her wooden toy teether and music box, to her custom sunshine macrame piece. The print seemed so fitting as it says “All that is golden likely has a bed of prayer underneath it.” My personal favorite though is her pair of booties. We picked them out while on our trip to Ireland which is where we talked about and decided to be starting a family soon. We wanted to bring home something special to have for a little babe one day and these handmade booties were just darling and so perfect. When we got pregnant 5 months after our trip with Peyton we thought that they would be for Peyton. We chose Peyton’s middle name (Moher) after the cliffs of Moher to remind us that our angel babe was first a thought in Ireland and that place and trip will always be so special to us because of that and now Juni has a little piece of that as well and will be able to wear those booties that are connected to her sibling. It is going to be extra special when we get to see her in them. The shelves were made by my husband, Dan who found the perfect color wood to match her room! The wooden box underneath holds her sweet brushes, a wooden toy, her precious rainbow teether and a watercolor painting that was done by hand by one of my best friends who made it specially for Juniper. Her accordion hooks hold more collected items like her wooden camera (I had to of course), her hat, her darling little romper, a hand dyed teether/lovey, a leather deer purse, one of her WildBird ring slings and a eucalyptus teether. Getting to hang all these things has been beyond sweet as they were each picked out with thought. Below that is her basket of blankets, some handmade ones from friends and family that we hold so dear! For those of you who know Dan and I, know we love our books! We hope Juni loves her books also which is why we dedicated a whole wall just for her books, (and thats not even all of them LOL). Each book was either picked out by Dan and I, a book that was collected before we were ever pregnant, or books that were given to her specially from friends and family. Behind her door has the beautiful weaved basket hangings and a hand made personalized embroidery hoop with her name on it which I love. Her corner shelves are also some of my favorite, also made by Dan, they hold little details. Another little watercolor painting by my friend Andrea occupies the top shelf, while the one below has her personalized wooden engraved birth announcement along with a hand made deer doll. The other shelves have a pull push wooden deer, which was one of the first toys I bought for her! There are some books, which the Paris and London ones are extra special too as she was in my belly as we baby-mooned in both places, and a wooden rainbow stacker set on the bottom shelf. The deer rocker next to the shelves was something I had hoped we would get to have for her room one day and to my surprise my two best friends got it for Juniper at my baby shower and it was so thoughtful and means so much to see it in her room and know one day she will get to play on it!